I feel like I need to write an apology to someone. I’d heard how good that this year’s DOOM was, but I never really gave it a chance. I’d been burned by AAA games in the past, and there wasn’t a lot about it that appealed to me; it almost seemed too much of a throwback to a time in gaming history I thought I’d grew out of. My interest in it grew after I scratched an FPS itch with replaying the Half-Life 2 series. Sometimes you just want to have good feeling gunplay, and I believe between the shotgun, pulse rifle and revolver in HL2, you’re usually set for feedback. Doom went on sale during the Fall Steam Sale, and this was a good enough reason as any to dive in; something that was $69.99 in Canada turned out for be $25, and watching some streams told me that there was some stuff in my first impression that I was missing. I’m a sucker for upgrading skills and weapons, and the collectibles and secrets factoring into that was what sold me on it. The more I played, the more I enjoyed it, and the more I just had to laugh. For all we say as “enlightened gamers” that we want more serious narratives and more emotive, deeper experiences, the most fun I’ve had with a video game all year has been tried, true, classic, Doom. Shotguns, rocket launchers, ripping a zombie’s arm off his body and beating him with it, and levels upon levels of brutality. Saying this will more than likely kill my cred as any kind of intellectual when it comes to this hobby, but I’m pretty much past that kind of pretense. These days, I’d rather have something I genuinely enjoy playing than another piece of media to make me feel terrible or depressed. There’s not necessarily anything wrong with those experiences, but at my current station in life I vastly more appreciate something I see on my Steam or desktop and think “yeah, I can justify popping this up for an hour or two” than something I find myself just pushing through in order to say I’ve played it. 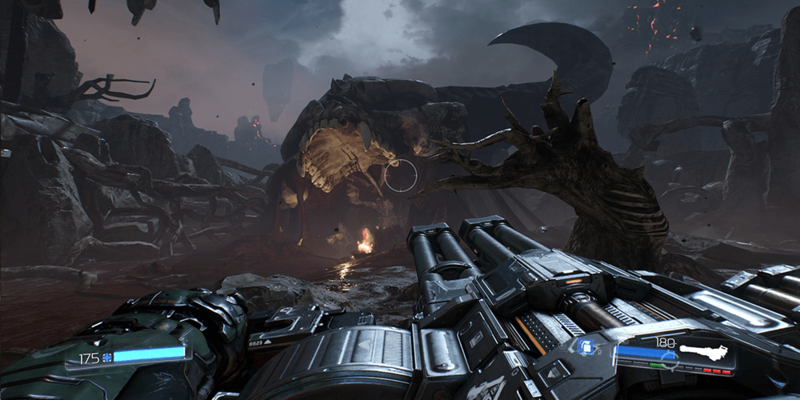 Both Doom and the opposite kind of games can obviously co-exist; I guess I was just surprised at how entertained I was with this game for its simplicity. This game is hardly subtle sometimes. The story is not Academy Award-worthy, but it never needed to be. It just needed to provide us with enough of a reason to push past one room to the other. The secrets keep you exploring levels and provide you with a reason to come back once you’re done, expanding your arsenal and just getting a lovely sense of satisfaction. Having a gun way before it’s intended to be given to you in the story is extremely satisfying, because it furthers the feeling that you are an invincible juggernaut. That is all the game needs to do for you: make you feel like a badass, have a great movement system, and have good gunplay. It does all of those things extremely well, as I have not gotten tired of any of the weapons and never feel bad that I have to use any of them. It’s fast; you end up whipping through levels at a pretty decent pace, and when you’re revisiting old levels with the double jump or passive upgrades that you’ve gained, it plays in a completely new way. In short, if you haven’t played it, play it. If you’re putting it off because of the pretense of it being “too old-school” a gametype for you, examine why that’s a big enough reason for you. I think when someone realizes that there’s nothing inherently shameful for liking the stuff they like — well, unless it hurts someone — it does wonders for their confidence. Blow stuff up and enjoy a metal soundtrack. Sometimes that’s all you need.